(15/P62) TRENTON – The Christie Administration has filed its first eminent domain actions against beachfront property owners to secure easements that the U.S. Army Corps of Engineers needs to build engineered beach and dune projects to protect lives, homes and businesses in the state’s economically vital coastal communities from severe storms and flooding, Department of Environmental Protection (DEP) Commissioner Bob Martin and Acting Attorney General John J. Hoffman announced today. These filings build upon the ongoing work the Christie Administration has been undertaking to secure easements necessary to construct these projects that are vital to protecting families, businesses and infrastructure. The Administration has secured 90 percent of the 4,279 easements needed since Superstorm Sandy struck the state in October 2012. Only 388 easements, from 244 property owners, are still needed. Work on coastal protection projects is underway along major portions of the shore, due in large part to the civic-mindedness of property owners who voluntarily provided easements. The eminent domain actions were filed in Ocean County Superior Court involving a property in Ship Bottom and in Cape May County Superior Court involving a property in Ocean City. In response to the destruction caused by Superstorm Sandy in October 2012, Governor Chris Christie issued Executive Order No. 140 in September 2013, directing the Attorney General’s Office and DEP to take any necessary actions to obtain property easements. The easements give the Army Corps right of access to construct beaches and dunes that will benefit the public. The vast majority of easements to date have been provided voluntarily. Commissioner Martin attributed this success to the civic responsibility demonstrated by property owners as well as concerted state and local outreach efforts, and, in small number of cases, the commencement of legal actions under the state’s Disaster Control Act. Earlier this year, however, a Superior Court judge in Ocean County ruled that the Disaster Control Act does not provide the legal authority to take permanent easements without instituting a condemnation proceeding pursuant to the state’s Eminent Domain Act. The bulk of the remaining easements are in northern Ocean County, ironically the area hardest hit by Sandy. Of the 326 outstanding easements needed there, 123 are in Bay Head and 68 are in Point Pleasant Beach. 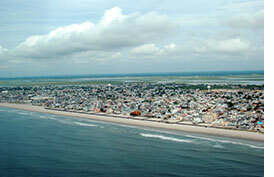 The ruling enabled the State to obtain an easement from beachfront property owners Harvey and Phyllis Karan for $1 as part of a settlement that ended years of litigation that started when the borough sought an easement from the Karans to build a 22-foot-high protective dune on a portion of their lot. The municipality used its power of eminent domain to acquire the easement. However, the parties could not agree on fair compensation and ended up in court. The DEP ultimately became an intervenor. A trial jury placed the value of the Karan’s easement at $375,000, and the Appellate Division upheld that verdict. However, on July 8, 2013, the state Supreme Court overturned the jury award and ordered a new trial. The Army Corps, DEP, and local communities have been teaming up to construct a comprehensive coastal protection system for New Jersey, largely funded by the federal Sandy Relief Act, signed into law in 2013. The Army Corps and DEP are currently undertaking a $128 million beach and dune construction project on Long Beach Island; a $57.6 million beach and dune project in southern Ocean City, the Strathmere section of Upper Township and Sea Isle City in Cape May County; and a $38.2 million project to construct beaches and improve infrastructure in the area of Loch Arbour, Allenhurst and Deal in Monmouth County. Work is expected later this year in Ventnor, Margate and Longport on Atlantic County’s Absecon Island; in southern Long Branch and northern Deal in Monmouth County; and in the northern Ocean County municipalities of Point Pleasant Beach, Bay Head, Mantoloking, Brick, Toms River, Lavallette, Seaside Heights, Seaside Park and Berkeley. A $202 million project to protect Union Beach, Monmouth County, with flood walls, levees, beaches and pumps, is expected to be launched next year.